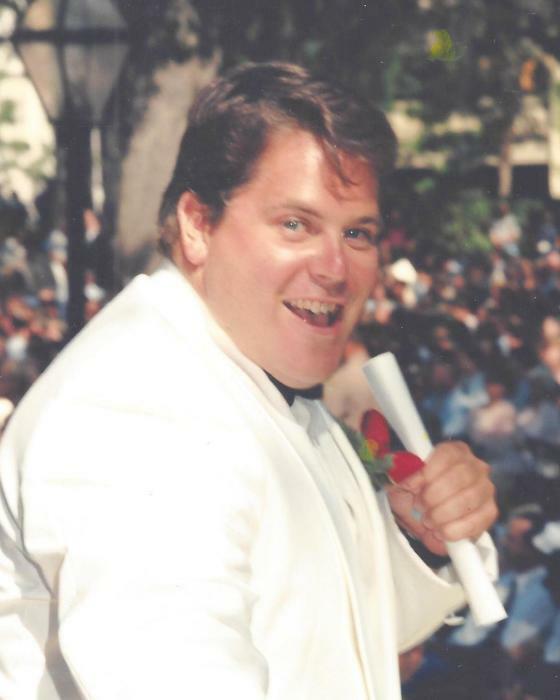 Obituary for " Jay " Joseph Donald Ahearn II | Thomas J. Shea Funeral Home, Inc.
“Jay,” Joseph Donald Ahearn II, 47, passed away on Sept 7, 2018 in Mt Pleasant SC after a courageous and brave battle with cancer. He was born April 23, 1971 in Binghamton NY. He was predeceased by his grandparents J. Donald and Irma M. Ahearn and Dr. Paul F. and Mildred L. Reich, as well as an uncle, Joseph L. Reich and cousins Kristofer Reich and Robert Reich. He is survived by his loving parents, Donald and Marilynn Reich Ahearn of Vestal NY and Kiawah Island SC as well as his sister Anne Ahearn Bozych (Scott ) of Canyon Lake TX. He is also survived by his loving aunts and uncles as well as many cousins. Jay was a 1990 graduate of Seton Catholic Central High School, Binghamton NY. While there, he played football on the undefeated varsity team of 1988. He then attended Niagara University before receiving a Bachelor of Arts in Political Science from College of Charleston in 1996. Upon his graduation, Jay stayed in Charleston and became a Master Sea Captain. His grandfather and namesake, J Donald Ahearn, introduced Jay to boating as a young child while in Alexandria Bay NY and the 1000 Islands. That introduction led to a lifetime love affair with the sea. Whether at the helm of his beloved Ahearn III, or guiding a private yacht down the intercoastal, Jay’s first and true love was the water. Jay adored his adopted hometown of Charleston SC, and had many frequent haunts , a particular favorite being The Cabana Bar at Water’s Edge on Shem Creek. On any given weekend, you could find him cruising Charleston Harbor or taking the Ahearn III through the locks to Lake Moultrie. He also loved the Abaco, Bahamas and had a reserved seat at Nippers. Growing up as a child, he loved exploring The Forest Prime Evil at Tripp Lake, PA with his grandfather Reich. Jay was a force of nature. He was the kindest, gentlest, funniest, most caring person you could meet. He was also sarcastic, irreverent, loyal to a fault, fierce and the bravest man in the world. Jay never met anyone who wasn’t a friend. He had an infectious laugh and was always quick to lend a hand. Most of all, Jay cherished his family. He spent Father’s Day each year on the waters around Charleston with his Dad, was very protective of his mother, and was his sister’s man of honor at her wedding. If you could sum Jay up in one phrase, “I do what I want, when I want” would immediately come to mind. A Mass of Christian Burial will be held at St Patrick’s Catholic Church, Binghamton, NY on September 22, 2018 at 10am with burial immediately after in the Ahearn Family plot at Calvary Cemetery, Johnson City NY. At the request of the family, there will be no calling hours. In lieu of flowers, the family asks donations be made in Jay’s memory to Our Lady of Lourdes Hospital Foundation, or Seton Catholic Central High School both in Binghamton NY. Arrangements by Thomas J. Shea Funeral Home, Inc., Binghamton NY and Charleston Cremation Center, Charleston SC.